How is your Halo: Reach-ing? Racked up a bunch of frags in multi-player yet? I’ve slacked off, and now most of my free gaming time goes toward Fallout and F1 2010. There’s a neat bit of news that may be of interest to some of you. 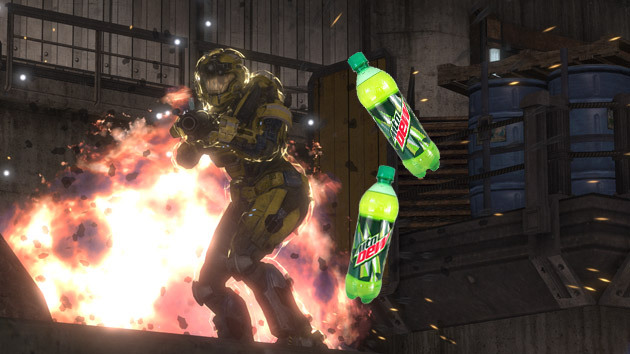 You know how when Halo 3 launched, back in 2007, there was a special edition of Mountain Dew? Well now Pepsi (Mountain Dew’s parent company) and Microsoft have teamed up~! again. It’s called Honor The Code, and it’s a fancy new contest that you and your friends can enter. You buy some Mountain Dew or Doritos, right? Then you have an option of entering the contest code at the Web site and winning a prize. Prizes are handed out every 15 minutes. So you can do that, or you and five of your friends can put your codes together and enter the daily Noble Team giveaway. What can you win? All sorts of stuff: controllers, Halo edition Xbox 360 consoles, headsets, art prints, hoods, etc. A nice little bonus if you’re a big time Mountain Dew drinker. This actually reminds me of the old Pepsi-iTunes giveaway from like 2003 or 2004. Underneath the cap there was a code for a free iTunes song. The thing was that you could tilt the 20oz bottle at a certain angle and see whether or not that bottle was a winner or not. So I’d stand there, tilting bottles in the back of some deli, then getting home and claiming my prize. No, I haven’t really lived a very exciting life, as you can tell.